It's a mode accessible from the main menu that lets you fight against a dummy character. You can use this mode to try out your moves and see how they work. Most of getting better at Fantasy Strike involves playing actual people, and not spending a lot of time in practice mode, but we have a full-featured practice mode for you anyway, in case you want it. By default, your opponent is a dummy that just stands there and gets hit. If you try to throw the dummy, by default they will NOT yomi counterA yomi counter is a unique feature of Fantasy Strike. Simply let go of all controls and you'll automatically reverse all normal throws attempted against you. you, even though in a real match you would get yomi countered. This is just to make the practice mode easier to use. If you'd like to enable yomi counters in practice mode, you can do so in the pause menu. You can directly control the dummy simply by using the controls for player 2. You don't have to turn that feature on—it just works. 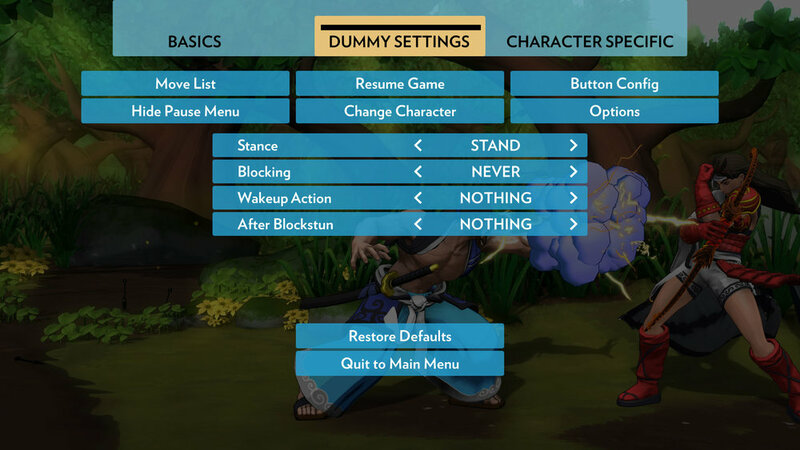 You can use the pause menu in practice mode to set various behaviors for the dummy. You can set whether it jumps or not, whether it blocks or not, whether it does an action right after it blocks, and whether it does an action right after it gets up from a knockdown. Fantasy Strike, like almost all fighting games, uses the frame as the basic unit of time. A frame is 1/60th of a second. The more frames a move has, the slower it is. Attacks have three parts: startup, active, and recovery. Startup frames can’t hit the opponent. Active frames CAN hit the opponent. Recovery frames can’t hit the opponent. It has startup / active / recovery frames of 12 / 7 / 25. If it hits an opponent, they will be in hitstunHitstun is the reeling animation you go into when you're hit by an attack. You can't do anything while in hitstun other than wait for it to end, and if you get hit again before hitstun ends, that's called a combo. for 22 frames. If an opponent blocks it, they will be in blockstunWhenever you block a move, you're briefly stuck in a state called blockstun. You're unable to do anything until your blockstun ends. for 20 frames. It has -9 frames of advantage time (on hit in this case), which is explained in the next section. The 7 startup and 19 recovery are straightforward enough. The middle part means that it can hit TWICE. It has 5 active frames for the first hit, then 7 frames where it can't hit, then 14 active frames for the second hit. Frame advantage is an important concept in all fighting games. It means how much sooner (or later) do you recover from a move compared to the opponent. In Fantasy Strike, this information is always displayed visually through effects when you hit the opponent. In practice mode, this information is also displayed numerically. For example, let’s say your move has frame stats of 13 / 7 / 28 and you make the opponent block it. You most likely made contact on the 14th frame; that’s the first of the 7 active frames in this move, though you might have made contact as late as the 20th frame. Anyway, you’ll be stuck in your animation for the rest of your active and recovery frames. Your opponent will ALSO be stuck though—they’re in blockstun because they blocked a move. So who will recover first? You can use the in-game training mode to find out. If you do Grave’s double palm and have the training dummy block it, the “advantage frames” are listed as -11 (it’s -9 if they don’t block it). The negative number there is bad for you. It means the OPPONENT recovers from their blockstun 11 frames sooner than you recover from your attack. If the opponent has a move that has 10 or fewer startup frames (since that would hit on the 11th frame) that can reach you, they can hit you back guaranteed. And even if they can’t do that, if you both do a move as soon as possible, you’ll be “11 frames behind” and you’ll probably get interrupted by the opponent’s move. The in-game frame advantage number is dynamic, meaning it’s calculated in real time as you do the move. You can see this by doing a jump kick at the training dummy and hitting them very high or very low to see the difference in advantage time. If you hit very high with Grave’s jump kick, you get about +11 frames of advantage time. If you hit very low, you get as many as +17 frames. The reason this number varies is that the later you hit them in your jump, the shorter the time is until you recover; meanwhile they will be in hitstun for the same length of time no matter when you hit them during your jump. Keep in mind that how “meaty”A meaty attack is the unfortunately named fighting game slang for doing an attack early against an opponent who is getting up from a knock down. When performed correctly, the frames of your attack that can actually hit are overlapping the opponent the exact moment they fully recover from their knockdown. you do your attack also affects your advantage time. For example, Grave’s neutral + A attack has 8 / 8 / 8 frame stats and is +4 on hit. +4 is great (you recovery 4 frames before the opponent does) but it’s not enough to combo into that same move a second time. The move has 8 frames of startup, so it hits on the 9th frame, and being +4 just isn’t enough to combo. But if you knock the opponent down and they get up into your A attack, you can time it so that you hit them with the very last active frame. If you do that, you can get the move to be as much as +10 or +11 frames. Then it WILL combo to itself. Hitting with a move late means there is less time until the move ends, so you end up recovering faster and having more advantage time. You can study this frame data in training mode to learn nuances of the game and know how safe or unsafe any move is. In practice mode, you pause the game in a special way to enter “frame step mode.” The top left corner of the screen tells you the button to press to do that. Once you’re in it, the top left also tells you the button to press to advance one frame. You can use this feature advance the game very slowly, one frame at a time, to see exactly how things play out and test various situations precisely. You can also do inputs precisely between frames. For example, while in frame step mode, if you hold the A button, then advance one frame, your character will start doing the A attack on that frame if possible. Remember that there is an input buffer (usually 8 frames) so if you press A on a specific frame but it’s not possible to do an A attack then (maybe you’re getting up from a knockdown or in blockstun), that input will still come out if it becomes possible within the next several frames. You can also enter inputs for player 2 during frame step mode (by using player 2’s controller, or player 2’s keyboard controls in the Steam version), so you can test interactions between moves. If you press and hold the frame advance button, it will advance one frame, then wait a half second, then repeat the frame advance over and over automatically. This allows you to “slow motion” for a while to get to a specific frame of a move you want without having to press the button repeatedly. Don't drown in the frames!